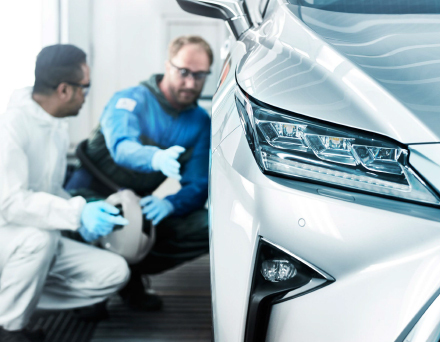 Sikkens is a pioneer in the development of the most advanced car refinish paint systems. Akzo Nobel invests in the research and development of Sikkens products to ensure they are at the forefront of paint technology, providing a perfect finish every time. As a market leader delivering firsts for over 225 years, Sikkens is dedicated to providing our customers with the latest product innovation – in both business and environmental sustainability and colour. From start to finish, we deliver the highest quality in everything we do. Innovative and sustainable products, service and colour are jus the start – it is the combination of our products, partnerships and people that ultimately create business value. The Sikkens product portfolio is an innovative and premium line based on key product values and attributes. Thanks to high pigment ratios, Sikkens products on average require fewer coats per job resulting in reduced paint usage, time and cost per repair. Sikkens products help produce a perfect, durable, invisible repair each and every time, leading to increased customer satisfaction for the car owner. Sikkens Colorbuild Plus, Setting the new standard in undercoats, a multi-functional coloured primer system that can be used for both sanding and non-sanding applications. You need only one primer system for any kind of repair. The right spraying mix is easy to achieve with the range of Sikkens European VOC compliant ancillary products. Sikkens Autowave MM 2.0, sets a new standard in waterborne basecoat performance with major advances in binder and pigment technology. It provides excellent coverage, metallic control and sprayability when duplicating OEM solid, metallic and pearl effect colours – with remarkable ease of use, first time right reliability and reduced process time. Sikkens Autoclear LV Superior clearcoat, for all repairs and application conditions, Two-pack VOC compliant clearcoat consisting of three clearcoats, one dedicated hardener, three reducers and one accelerator, designed for optimum application properties. This product covers all sizes of repairs at optimum quality levels under all application conditions. Ensures a very robust and reliable product performance combined with a high gloss level on Sikkens Autowave.